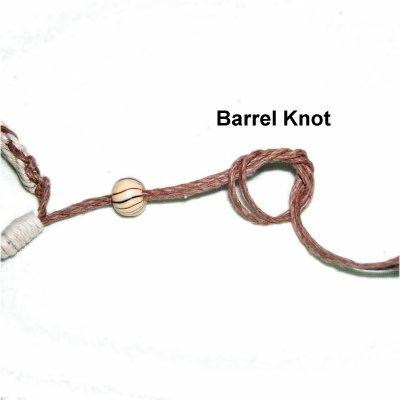 Description: This Hemp Bracelet features a bead or button in the center, surrounded by a Buttonhole Stitch design. 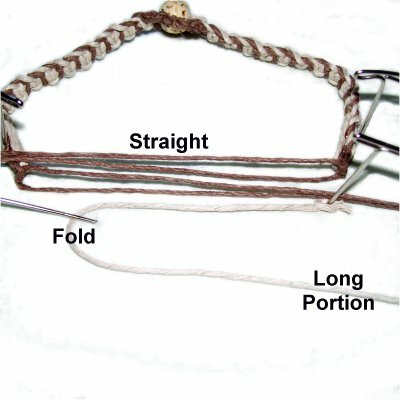 The tire-tread pattern of this Micro-Macrame bracelet is made by a vintage technique known as nesting. Using two colors really brings out the style of this technique, but you can use one color if you wish. This is an easy Micro-Macrame pattern, so is suitable for beginners who have experience with all the knots used in the design. Choose your Hemp Carefully! Inspect the material to make sure it is not too dry, which will make it feel coarse. Hemp is supposed to have a slight sheen and feel comfortable against your skin. You can use other materials if you wish. When using Hemp cord, I recommend you get a stick of Beeswax to coat the material. Make a small notch and pull the cut cords through it, or rub it on the cords like a crayon. Cut 2 cords of each color, at least 8 times the finished length of the bracelet. So for a 7-inch bracelet, the cords should be 56 inches or longer. For the clasp, cut 1 cord, 15 inches long. Prepare the ends with glue to prevent unraveling, and apply beeswax (optional). Divide the finished length by 2. Subtract 1 inch. The result is the length you need for each half of the band. Step 2: Place the cords vertically on your board, and place a piece of tape horizontally 8 inches from one end. The two short fillers should be in the center, with the long working cords on either side. When using two colors, the darker cords should be in positions 1 and 6. Since you will be tying Square Knots for the Hemp Bracelet, the four images below show the steps. 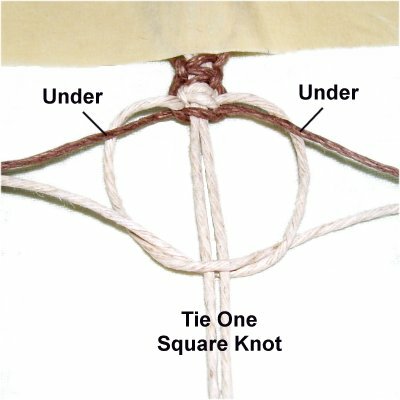 The first knot is tied with cords 1 and 6. The fillers are the other four cords (2 - 5). << Move cord 1 to the right, over the fillers and under cord 6. Move cord 6 under the fillers. << Move cord 1 to the left, over the fillers and under cord 6. 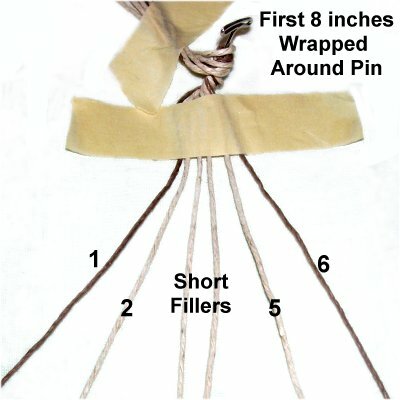 Step 3: Use working cords 1 and 6 to tie the first half of a Square knot, around the filler cords only. Make sure they pass over working cords 2 and 5 as you bring them down to tie the knot. Step 4: Move cords 1 and 6 horizontally right and left. Each time you use cords 2 and 5, you will ALWAYS tie a complete Square knot. When using cords 1 and 6, you will tie the first half of a SK, and the next one will be the second half. Try to tighten all the knots with the same amount of tension, so the loops along the edges of the Hemp Bracelet are neat. 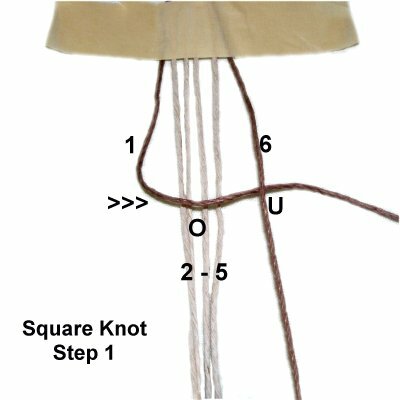 To keep track of which half of the knot you tie, a simple counter can be made. 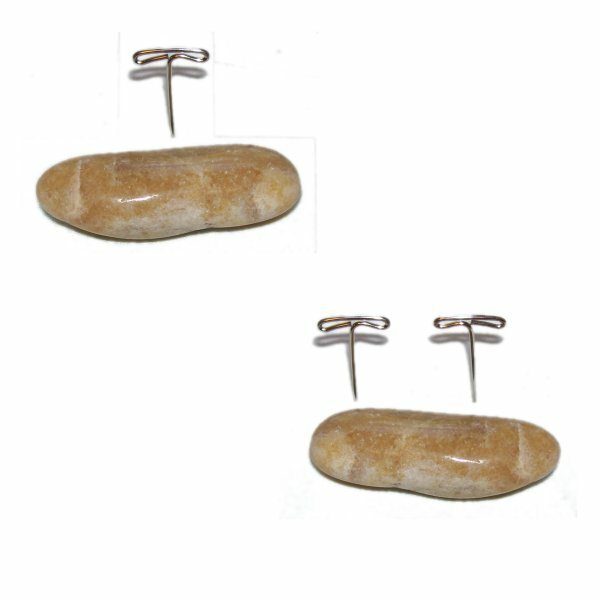 Move a stone back and forth in front of either one or two pins. This will tell you if the first or second half of the knot is to be tied. Step 5: Move cords 2 and 5 horizontally to the right and left. 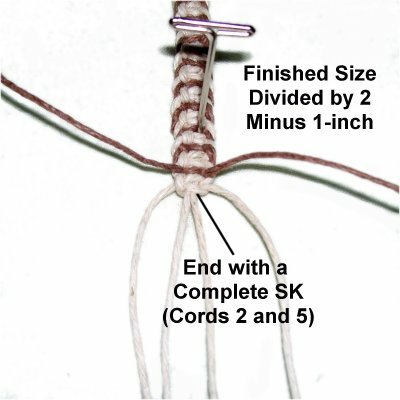 Bring cords 1 and 6 under 2 and 5, and then tie the second half of the SK you began in step 3. Important: You began step 3 by moving cords 1 and 6 OVER cords 2 and 5. This only applies to that one step. For step 5 and the remainder of the Hemp Bracelet, always start by bringing the working cords UNDER the ones previously used. Step 6: Move cords 1 and 6 to the sides, and bring cords 2 and 5 under them. 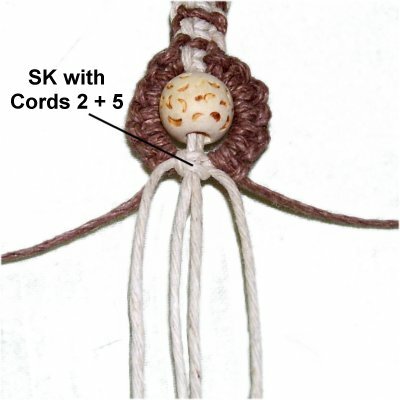 Tie a complete SK with cords 2 and 5, as in step 4. 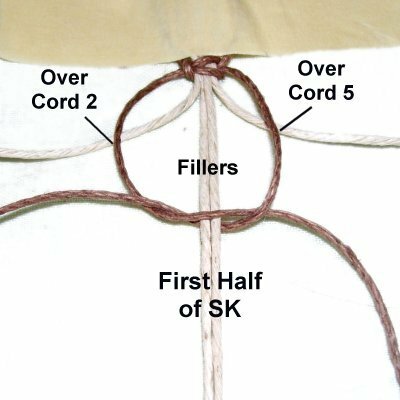 Tie the first half of the SK with cords 1 and 6. Pass them under cords 2 and 5 before you do so. 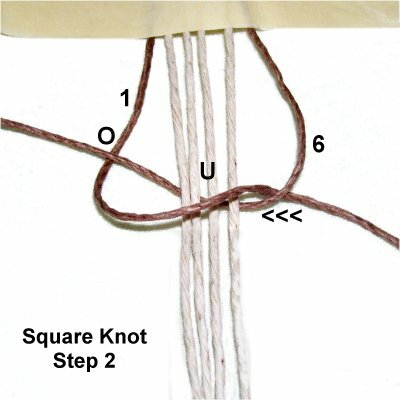 Repeat step 5, tying the second half of the SK. Continue alternating between the two sets of working cords, until the band is the size you came up with when you did the math in step 1. 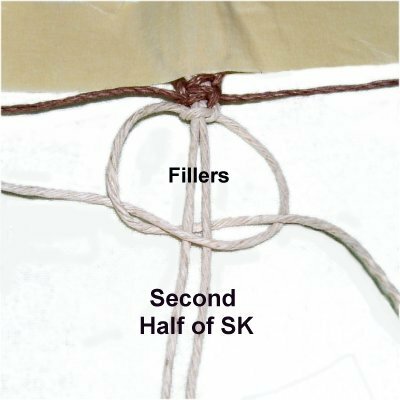 Make sure you end with the complete SK tied with cords 2 and 5 (step 6). Step 7: Now it's time to work on the center portion of the Hemp Bracelet. 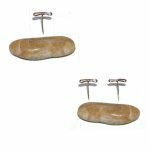 Slide the bead onto cords 3 and 4 (fillers). 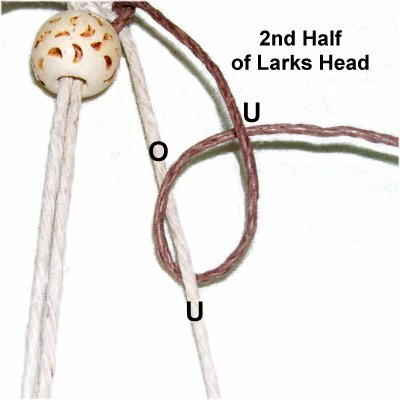 Use cord 6 to tie the first half of a Vertical Larks Head knot onto cord 5, rotating clockwise. Bring cord 6 over and then under cord 5. As you pull the cord to the right, pass over cord 6. 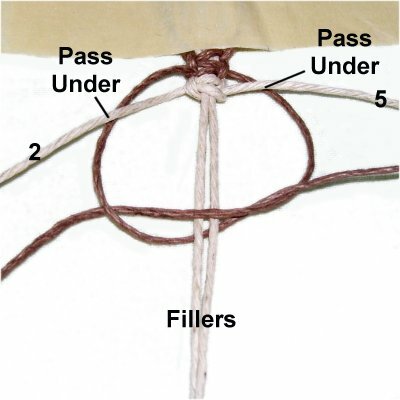 Tie the second half of the knot just below, by passing cord 6 under - over cord 5. Bring it under cord 6 as you pull it to the right. Both steps equal one Larks Head knot. Step 8: Tie several more Larks head knots, until the buttonhole design reaches the bottom of the bead or button. 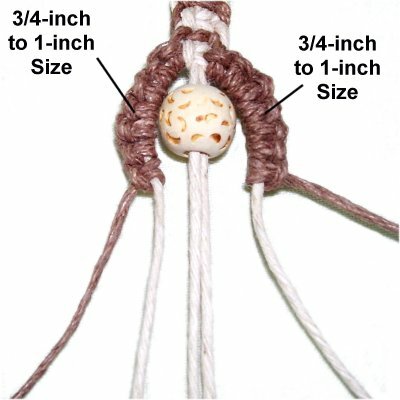 Add extra knots until the sennit is 3/4-inch to 1-inch long. Repeat the process on the left side. 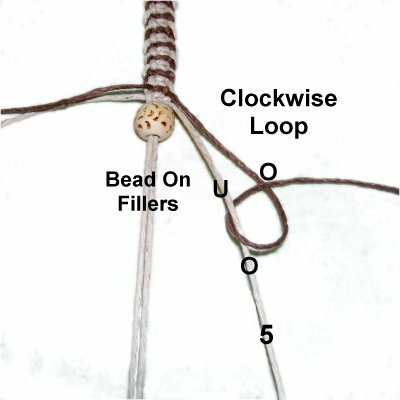 The knots are tied with cord 1, rotating counter-clockwise. 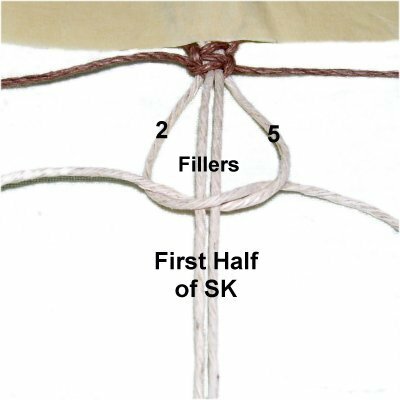 Tie a SK with cords 2 and 5 to close the buttonhole loop. The knot should be tied around the holding cords only. Cords 1 and 6 are not used in this step. Step 9: Repeat steps 3 - 6 to make the second half of the Hemp Bracelet. 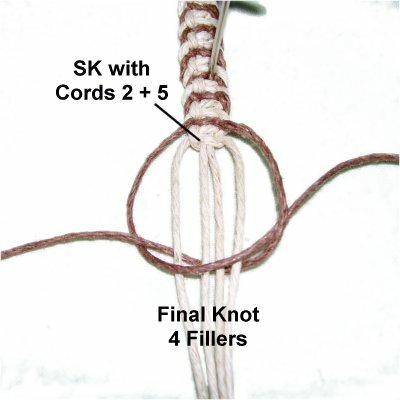 So the next knot tied is the first half of the SK using cords 1 and 6 (step 3). The band should end with the complete SK made with cords 2 and 5 (step 6). 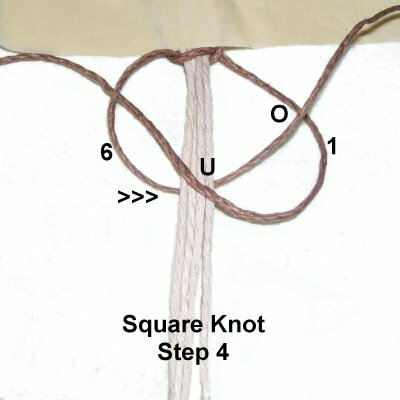 Tie the final knot with cords 1 and 6 around the other four cords, as in step 2. 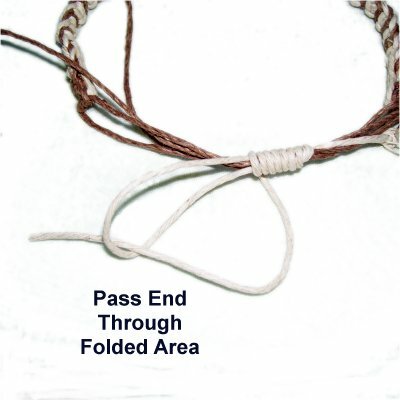 To finish off the cords for the Hemp Bracelet, flip it over so you are working in the back. Fold cords 2 - 5 backward, towards the band. Arrange the cords neatly and apply glue under them. Hold the cords with clips until the glue dries, then cut off the excess material. 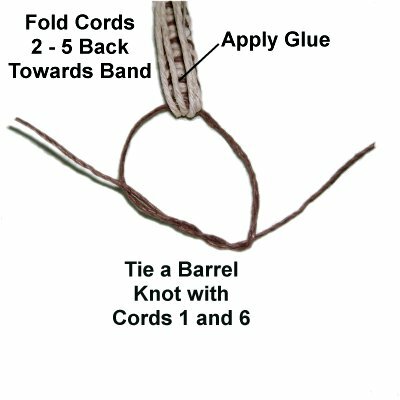 Tie a Barrel Knot with cords 1 and 6. Pull the ends horizontally when tightening, so it's as flat as possible. You can apply glue if you wish. Cords 1 and 6 will now be used as part of the sliding clasp described below. Step 10: Arrange the Hemp Bracelet so the remaining ends (cords 1 and 6) are straight and resting next to each other horizontally. 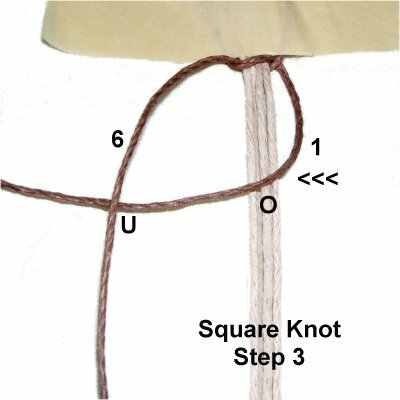 Tie an Overhand knot at one end of the 15-inch cord. Secure the knot next to the straight ends, on the right. Move the cord left, fold it, and then bring it back to the right. The long portion is used to tie the Wrapped knot. Wrap firmly but not tightly, since the ends need to slide through the knot. Progress from right to left, wrapping for at least 1/2-inch. Pass the long end through the folded area, which looks like a loop. Pull the end that was secured (with the knot). The loop and other end will be pulled inside the Wrapped Knot, securing it. Make sure it's pulled about half way through the knot. 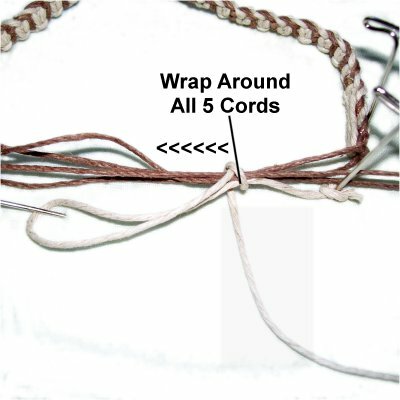 Trim both ends of the clasp cord flush with the edges of the knot. Make sure you don't cut the other four. 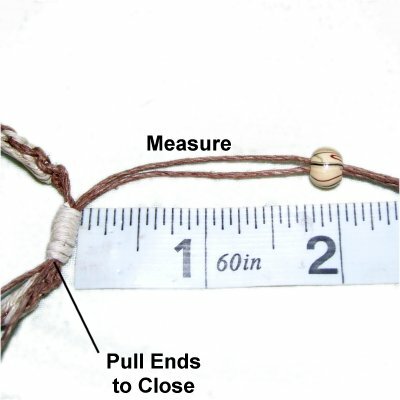 Pull the ends to close the Hemp Bracelet. Apply one bead to the two ends if you wish. Measure 2 inches from the Wrapped Knot. 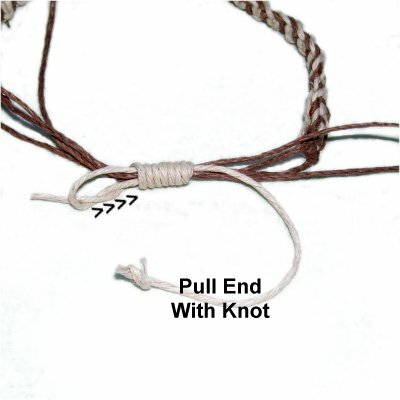 Tie a tight Barrel knot with the two ends working together, placing it at the spot measured. Repeat with the cords on the other side of the clasp. Have any comments about the Hemp Bracelet? Contact Me.